Bar & Bat Mitzvah preparations and tutoring available. Jewish tradition has always promoted a loving approach from one human to another. We are dedicated to making the richness of our Jewish heritage accessible to the contemporary Jew, every Jew, no matter what their affiliation or level of religious observance. Through drama, song, art and stories we bring Judaism to life. Our innovative methods make learning fun and memorable. We teach history by showing Jewish history alongside secular history, a method that encourages critical thinking. Through our Mitzvah curriculum we emphasize each Mitzvah's meaning for everyday life, in addition to the how-to of ritual observance. Our Hebrew language curriculum ensures that your child will be able to read from a Siddur (prayer book). More than that, your child will understand the meaning of many of the prayers. No matter what synagogue your child affiliates with later in life, she or he will share the language of prayer with Jews around the world. Our students become familiar with the Hebrew alphabet, learn to read, and become accustomed to Hebrew vocabulary. This subject also familiarizes our students with the Siddur- Prayer Book, allowing them to feel comfortable in the Synagogue. This subject offers an overview of the weekly Torah portion, its highlights and practical lessons relevant to our day and age. We take our students from Creation to modern-day Israel including the Exodus from Egypt, The Ten Commandments and the era of the Prophets and Kings. We also focus on Jewish life in medieval times, the Spanish Inquisition, the Holocaust and Jewish Heroes of Yesteryear. We create projects that have Jewish holiday and mitzvah themes and will add an elegant taste of Jewish decor to your home. Our students understand that Israel is not just another country but our own homeland. A land that is truly the “Promised Land”, both spiritually and physically. Prepare your child for the most important day of young adulthood. The transition from child to teenager is an important milestone in any child's life. We offer private lessons to prepare your child for this momentous occasion. Additional fee apply for Bar/Bat Mitzvah instruction. 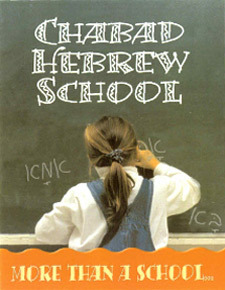 Chabad is proud to offer a new tutorial program for all Jewish children. Our one-on-one format allows your child to grow at his/her own pace, and to receive the undivided attention of a skilled educator. This method of learning has proven to be very successful. Synagogue membership is not required. Payment plan available. No child will be turned away for lack of funds.